Inspired by the Wyss Institute’s magnetic blood-cleansing technology, a team of budding young (9- to 14-year-old) scientists has conceptualized a system that could purify raw milk without pasteurization. The five kids from Shepherdsville and Louisville, Kentucky, theorized that the same technology in which magnetic microbeads are used to pull pathogens out of human blood to treat sepsis could be applied to remove bacteria from raw milk, making it safe for consumption. Their Immuno-Magnetic Milk Separator bested inventions by 42 other teams to cinch the state robotics championship title at Western Kentucky University in February. Next month, they will take their creation on the road–traveling to Florida to test their skills against 65 teams from around the world in the Food Factor Invitational Open Championship. The event is part of the First LEGO League, a robotics program created by FIRST(R) and the LEGO(R) Company to get children excited about science and technology. While the students spent considerable time reading up on magnetic microbeads, they also benefited from their own private web conference with Wyss Founding Director Donald Ingber, who is the Principal Investigator on a project to develop a sepsis treatment device for the Defense Advanced Research Projects Agency. Ingber is also a Professor of Vascular Biology at Harvard Medical School and a Professor of Bioengineering at the Harvard School of Engineering and Applied Sciences. In a 40-minute call last month, he fielded questions about how to scale up his technology for use with much larger quantities of liquids. Mooney’s younger sister Lilly, 10, is also on the team and participated in the call with Ingber. She had wanted to know how many magnetic beads it would take to clean the milk in the model that they had built, which uses two liter bottles, and she was also worried about the potential for the milk to clump and jam up the device. Both girls think that their unusual tutorial has helped cement their knowledge of the subject matter, which will surely help them at the upcoming Invitational Open Championship. 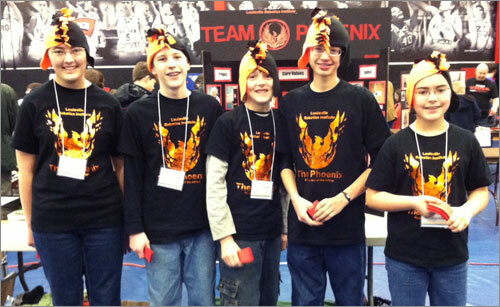 The team, which goes by the name “The Phoenix,” consists of fifth through ninth-graders Hannah Mooney; Adam Cecil, 13; Spencer Pennington,13; Cole Davis,13; and Lilly Mooney; (pictured left to right in the photo taken by Hannah and Lilly’s mom, Melissa Mooney, at the state robotics championship). The students, all of whom are home schooled, came together over their shared love of robotics and science. Several of their parents serve as coaches. First LEGO League selects a different theme/challenge every year. This year it was food. The teams were asked to chose a specific type of food and follow it from farm to plate, with an eye toward identifying any safety issues. After doing their research, the Phoenix team members decided to focus on milk, in particular the ongoing debate over the merits of raw versus pasteurized milk. Some people believe that raw milk is nutritionally superior, while others insist that pasteurization is necessary in order to prevent diseases like salmonella and e.coli. However, pasteurization does more than kill off dangerous germs, it also destroys some of the nutritious elements. The team’s original idea had been to develop a way to test raw milk for bacteria, which led them to Ingber’s work. His technology uses magnetic nano- and micro-particles coated with a human opsonin–a key component of the body’s innate immune response–to remove pathogens from flowing human blood using magnetic forces. As the students learned more, they decided to not just test the milk, but to purify it as well. Their Immuno-Magnetic Milk Separator has the potential to appease both sides of the raw milk vs. pasteurized milk issue by removing harmful bacteria without touching the nutrients. This solution is very similar to the Wyss’s proposed sepsis therapeutic, which would clear the blood of pathogens, without removing normal blood cells, proteins, fluids, or electrolytes.